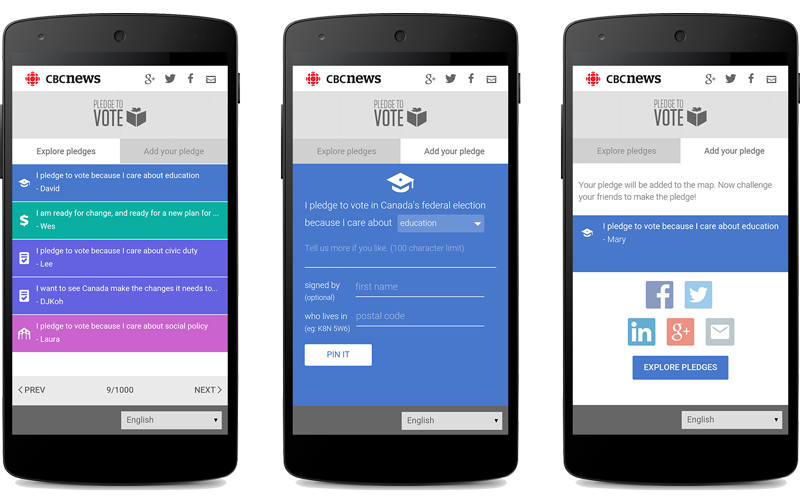 The Canadian Broadcast Corporation (CBC), the national public radio and television broadcaster in Canada, wanted an interactive application on their news site that lets viewers make their voices heard while motivating others to vote in the upcoming Canadian federal election. Left Field Labs developed an online experience for the CBC that provided Canadian voters a place to pledge to vote, personalize it with what matters most to them, and share it with others. In order to provide users with ways to categorize their interests, we developed the application to allow users to select a category: Civic duty, Leadership, The economy, Taxes, Energy, Education, Environment, Public safety, Health care, Social policy, International affairs, or Other and add a sentence or two elaborating on what issues are important to them. Once submitted, their pledge shows up on a map of Canada in the postal code they were pledging from, along with others’ submissions. Viewers can browse the map of pledges and filter by categories that are of interest to them. In addition, the application helps voters spread awareness and motivate others by sharing Facebook, Twitter, G+, LinkedIn, or email links announcing that they #PledgetoVote. Created frontend application using Closure framework.